Plato said, “Only what is rare is valuable, and water, which is the best of all things … is also the cheapest.” This summer’s drought through the Midwest offers living testimony to his riddling aphorism. The National Climactic Data Center has called it the “worst drought in 55 years,” with over half the entire country seeing “moderate” or “extreme drought” conditions and one-third of the country seeing “severe” to “extreme” conditions. During a year when more corn was planted than in any other since 1937 – including last year, when the harvest reaped $76.5 billion – prospects look grim. 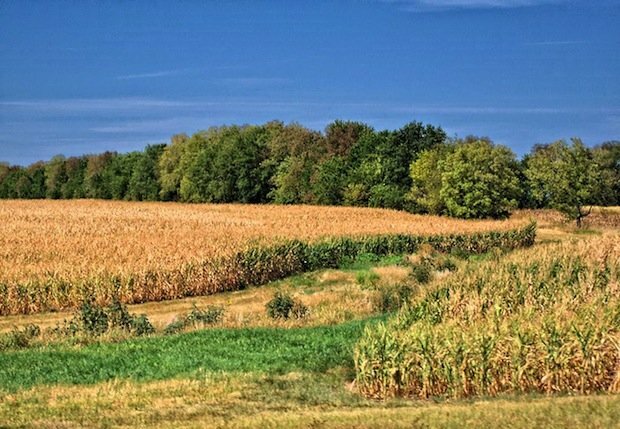 In early August, The United States Department of Agriculture rated 51 percent of the crop as “weak” to “very weak,” a number that is likely to increase as the drought’s latent effects spread. Among all these numbers and their accompanying splotchy red maps of dry lands, it’s important to consider the Humane Education lens. Working from the connection between people, land use, and resources that HEART’s lesson plans establish, the drought offers a chance to stop and learn something about the structure of American agriculture. According to Dan Charles, food and agriculture correspondent for National Public Radio, 40 percent of the corn raised in the U.S. goes to feed animals, 40 percent goes toward the production of ethanol, and the rest goes largely to food ingredients, like high fructose corn syrup. In the U.S., nearly 10 billion land animals are processed (raised to be slaughtered) each year. According to the United Nation’s Food and Agriculture Organization (UNFAO), 30 percent of the Earth’s ice-free land is directly or indirectly involved in livestock production. UNFAO estimates that livestock production generates nearly a fifth of the world’s greenhouse gases – more than transportation. Between 1961 to 2008, per capita world meat consumption more than doubled. It is expected to double again by 2050. 2.2 pounds of beef is responsible for the equivalent amount of carbon dioxide emitted by the average European car every 155 miles or enough to burn a 100-watt lightbulb for 20 days. Americans consume something like 110 grams of protein a day, about twice the federal government’s recommended allowance, with about 75 grams of this coming from animal protein. Though 800 million people on the planet suffer from hunger or malnutrition, the majority of corn and soy grown in the world feeds cattle, pigs, and chicken. Consider that it takes around 2000 gallons of water to raise a pound of beef – or 100 times more water than a five-minute shower – and it’s not hard to see why the Ogallala Aquifer, which sprawls through eight states and covers one-sixth the land area of the lower 48, is at one of its lowest recorded levels. If a tenet of Humane Education is to question inherited problems and respond in a solutionary fashion, the drought is calling our teachers and students. With its lessons on factory farming, the ethics of human/animal relations, resource management, and ecological “footprints,” the HEART curriculum offers several launching points to better understand the hard facts of this drought. Peter Brabeck, chairman of global food conglomerate Nestle said, “I am convinced that, under present conditions and the way water is being managed, we will run out of water long before we run out of fuel.” This is where you come in.